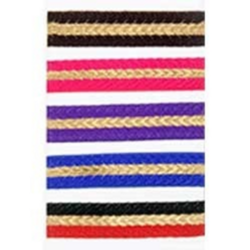 We are a leading Manufacturer of braids and ribbons from Surat, India. By focusing on variegated demands of our respected clients spread all over the country, we are offering an exclusive gamut of Braids and Ribbons. Our designers utilize best quality raw material in the designing process of this product to ensure its unsurpassed quality and finish. Distant from this, clients can avail this product from us in surplus of designs, colors and patterns as per the personage predilections of clients. 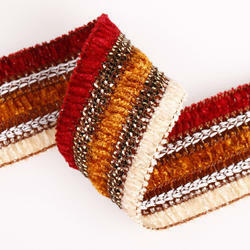 By keeping in mind clients variegated choices, we are offering an interesting collection of Braids and Ribbons. With the use of guaranteed fabric and modern designing techniques, we are offering an unmatchable collection of laces. 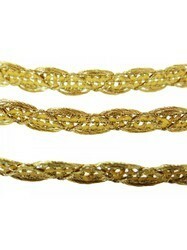 Quality and design of these laces have been maintained as per the current market trends. These laces have gained appreciation from every nook and corner of the country for their remarkable quality and stylish pattern. Backed by a team of creative and skilled designers, we are engaged in manufacturing, exporting, trading and supplying an excellent range of Braids and Ribbons. The offered product is designed using higher quality raw material and complex techniques as per the worldwide standards. The product offered by us is checked on a range of quality parameters under the regulation of our knowledgeable designers. In addition, offered product is presented in different gorgeous designs and patterns as per the qualifications of our esteemed clients.